Why “WST” ? Why Now? Despite today’s setbacks, central stations still manifest one of our great civic intentions: to create a fine, welcoming building to the central business district. While a station update also has many other motives, obstacles block almost every U.S. city that attempts the required improvements. While specific causes vary by city, “WST” synthesizes them into two general causes. First, many planning efforts are driven by the mayor. This authority — which rarely extends beyond municipal streets — is a misfit for the politics of regional rails. Most plans fall way short because no entity has the authority to update to the 21st Century standards which includes a through-station and increase rail efficiency, particularly at peak. Second… if the new station does get started, it usually succumbs to the well-trod path of busting its budget. This erases the agency’s justification for future taxpayer support that is needed to finish the station and provide a better service. Progress de-railed. If we are to end America’s wasted decade of great civic intentions not producing better rails, we first must note candidly how other governments succeeded. Most of Europe’s major terminals have been converted into through-stations as part of updating trains for the new era. Using trains to transform economies into thriving urban networks gives the U.S. a shot at achieving sustainable transportation. This website derives sustained inspiration from a major shift started by The Eno/Transit Center joint study released in 2014, “Getting To The Route of It: The Role Of Governance In Regional Transit”. Eno’s role as a multi-modal think tank and executive trainer would not allow its study’s next logical step: to prescribe regional rail restructuring. Hence, another “WST” purpose emerged: a forum to discuss frankly how regional transportation policies need to be shaped by suitable agencies for the sustainable era. Finally, I view “WST” as the middle generation of a ten year project. The first generation is my series of eight articles finished in 2014 in “The Urbanophile” that Aaron Renn, very graciously, has spared from his achival winnowing. Scoring the nation’s busiest stations, most articles had very similar problems emerge: updates were failing because authority was misaligned. As the second generation, “WST” started as previews of chapters that, ultimately, would propose governance solutions specific to the individual metro. When concluding those previews for how stations can improve metropolitan networks, this site will sketch how a national policy and standard can emerge. During 2019, a third generation will start; although it is unclear how long this website will continue or another will replace it. 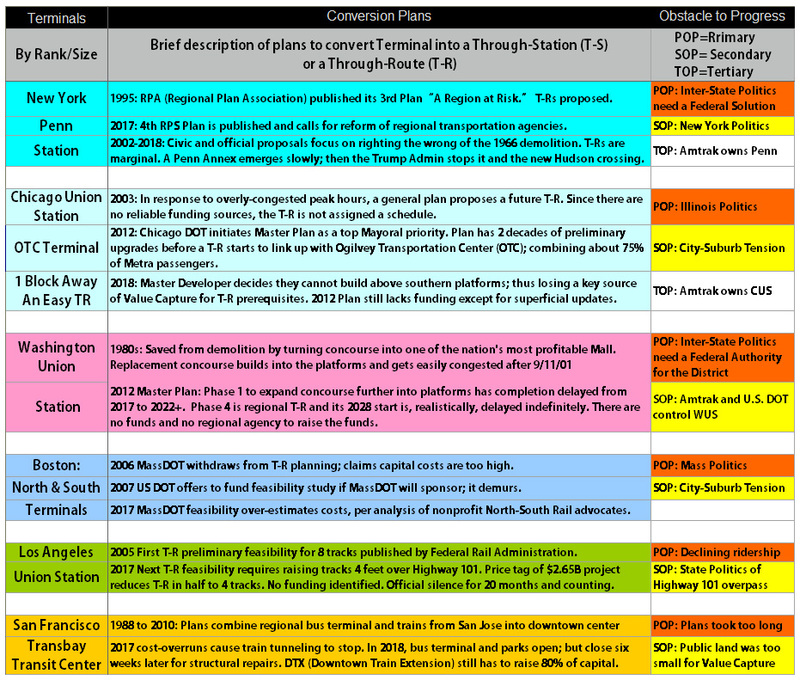 Upon wrapping up “WST” with what I call its “Transition Trilogy” sometime in mid-year, I will work with others to produce fuller proposals for key regional rail systems from DC to Boston. I will use “WST” and these proposals to serve as the basis for a more permanent report or, more likely, an e-book. Whatever its role after 2019, this website starts a strategic effort to synthesize research to transform a key regional transit service that, frankly, needs lots of guidance if we are ever to transform auto-dominated policies and encourage auto-alternatives. I have spent much of my retirement extrapolating how a central station update poses an opportunity to find strategic answers to regional transportation. It continues to be a fun and productive way to spend retirement. Please find it useful. Thanks. Consider this header to be a train station triptych that tells the story of what this website does: it informs about the obstacles to regional rail, it proposes solutions and, then as a collegial as we can, discusses options for getting things done. On the triptych’s left is the Information Booth at LA’s Union Station, a gem that gives directions to a larger gem. When I took this photo, no one was giving directions and that seems a good metaphor for commuter trains and “WST.” LAUS was built as one of three great buildings in which civic leaders seemed to say: “We are going to build a great city.” Unfortunately, LA got in biggest and earliest with transportation’s Faustian Pact with the auto. While LAUS has one of the better chances of being updated and becoming a through-station, regional LA train travel has flat-lined relative to population growth. This type of Information questions why the LA Transit Renaissance is spending so much per rider. From key pieces of Information emerge new analyses and “WST,” then, proposes a more effective strategy — or deal — to reduce congestion and transportation costs. The triptych’s middle photo symbolizes that Americans can update commuter rail. I selected a rendering from Philadelphia’s 30th Street Station’s plans to build a new neighborhood around the only major American station that has the intersection of two directional through-routes; much like the best in Europe and Asia. SEPTA’s commuter lines at the upper level (behind the view of this photo-shop) are an east-west through-route to two downtown stations, Suburban and Jefferson. The steps leading down go to 30th Street’s lower level platforms and Amtrak’s north-south through-route. In the capacity-building potential of through-runs, SEPTA still is far behind the authorities that made Europe’s success. But Philly at least has good bones in which a dose of good regional politics can speed-up transportation’s transformation. Finally, that’s my mug on the triptych’s right photo. While my wife took the photo, she doesn’t like it saying: “It makes you look like an old transit geek.” And I probably am; having studied intently over 10 American rail systems and 112 stations on-site worldwide. To my credit, my wife received the primary fringe benefit of being married to a transit geek: I dragged her through about three dozen of Europe’s finest stations. Free tour and selective commentary. What a swell guy. In addition to my passion for updating terminals, I also have a public policy background. It started intensely micro-economic and lasted from about 1988 to 1994 when I lived in Washington DC and founded a public interest nonprofit that tried to interpret what the “new economic empowerment paradigm” (remember that wonky phrase?) really meant for households; asking “What’s the deal?”, the social contract. While I kept urban planning as an interest all of my adult life, I got serious about it again in 2008 when I served on the Citizens Advisory Committee of the first regional plan to come out of the newly merged Chicago Metropolitan Agency for Planning. The regional politics that I encountered then, let’s say, I am still trying to solve. Hence, Corridor-based authority as a transition. I won’t take up more of your time now with more of my credentials. But I am glad to share them one-on-one with you if asked and will write them up for the next phase of this website, which I hope emerges in late 2019. Having spent 2018 analyzing eight major regions with commuter rail and outlining corridor-based proposals for them to evolve into regional rail, I will be sketching proposals in 2019 for a federal policy for regional rail that helps metros govern their transportation better. Following those articles, the website will evolve into more of a forum to propose that federal policy so it syncs with each region’s needs. I like being in the western world’s rather specialized network of transit researchers and writers. Many solutions proposed on this site are first-cuts at dealing with the reality of poor, if not backward, governance. By definition, “backward” resists progress. But as a community of transit experts, we can still can make progress with exacting proposals that question existing assumptions and agencies that are not moving us forward. So, please give me your Comments at any time.